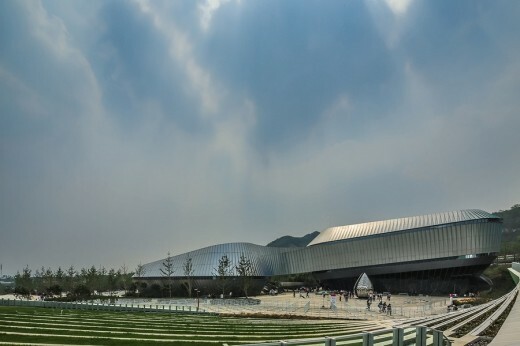 Following selection in the 2011 competition UNStudio’s Qingdao World Horticultural Expo Theme Pavilion in Qingdao has been realised. 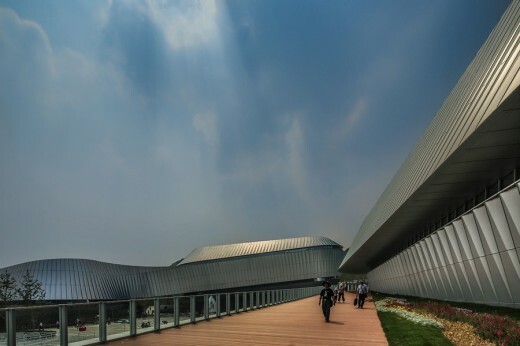 The World Horticultural Expo 2014 takes place the Chinese city of Qingdao (from April to October 2014) and is expected to attract 15 million international visitors. The main theme of the expo is ‘From the Earth, For the Earth’ and aims to encourage the exchange of culture, technology and horticultural knowledge. 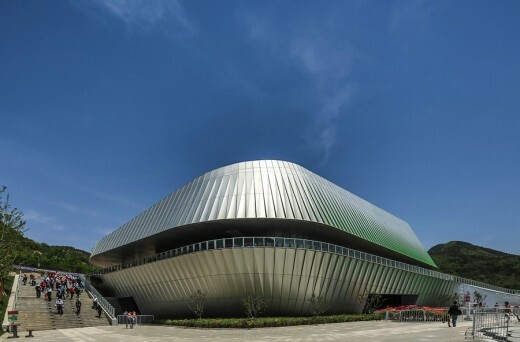 In its design for the Theme Pavilion UNStudio combines expert knowledge of logistics, spatial organisation, specialised typology, future flexible usability, function programming, façade intelligence, user comfort and sustainability. 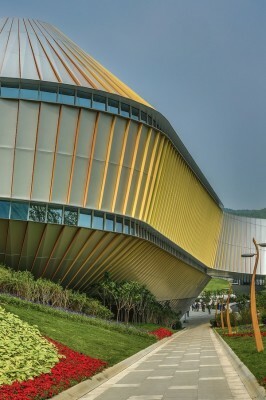 The 28,000 square meter Theme Pavilion comprises the main Expo hall, a grand performance hall, a conference centre and a media centre. 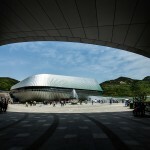 The architectural design gesture for the pavilion is borrowed from the shape of the Chinese rose – the city flower of Qingdao – and converted into the floor plan layout of the design. 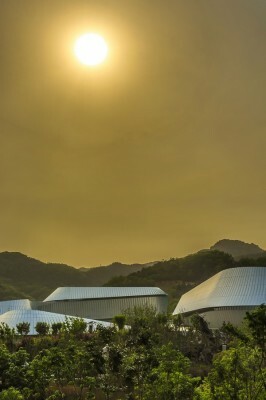 The four pavilion volumes or ‘petals’ are connected by internal and external walkways and frame a central square which becomes a ‘stage’ for the visitors: a dynamic focal point surrounded by viewpoints on varying levels. 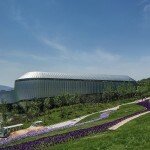 The Theme Pavilion operates as the platform for monthly programmed and seasonally themed activities, featuring flowers in spring, shading in summer, fruits in autumn and greens in winter. 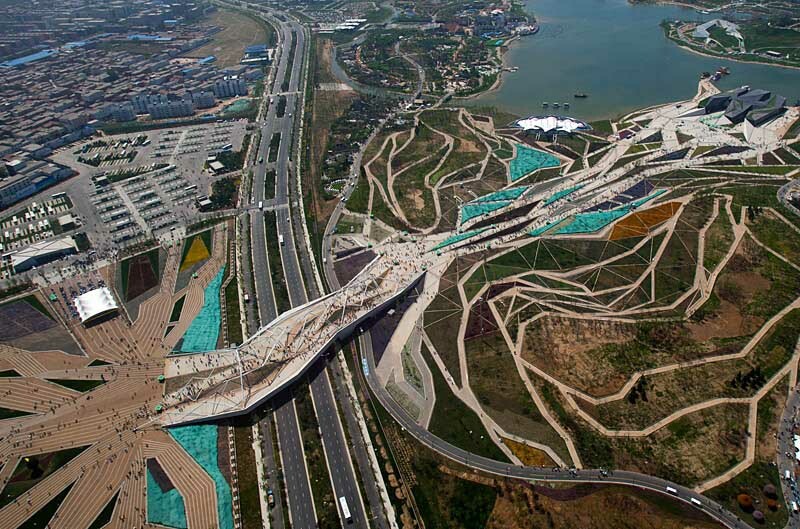 ‘Rainbow Ribbons’ provide the routing and infrastructure for the expo and permeate the surrounding landscape. 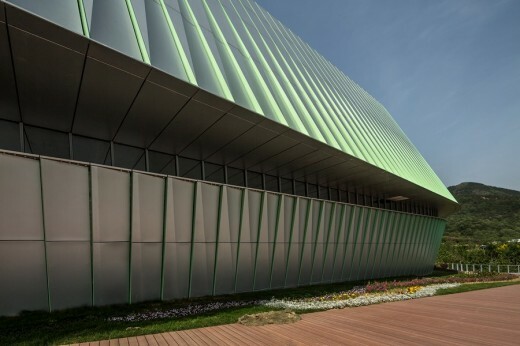 This colour concept is further reflected in the facade elements which are constructed from vertically folded aluminium panels. The four theme colours (green, yellow, orange and blue) are applied along the lengths of the vertical folds, appearing and disappearing depending on the viewpoint. 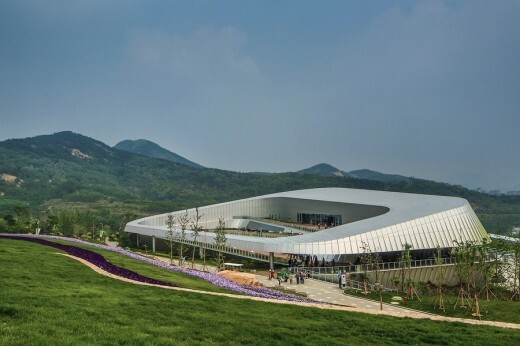 The World Horticultural Expo will cover nearly 5 million square meters, encourage the participation of more than 100 countries and is expected to attract more than 6,000 visitors daily. 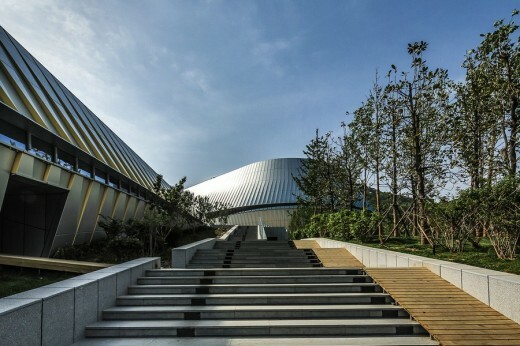 In addition the Expo will function as a catalyst for other undertakings and initiatives in the city of Qingdao to improve the city quality as a whole. 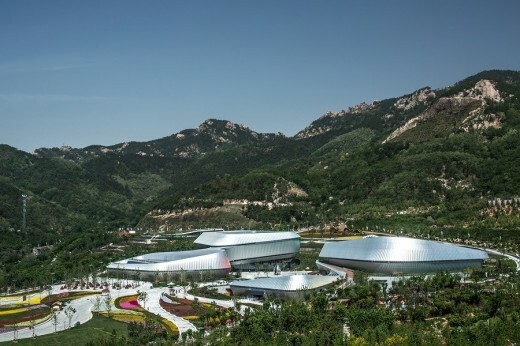 Following the World Horticultural Expo 2014, the landscape art themed expo park will become a new venue for eco-tourism, which will shift the focus of Qingdao’s tourism from sightseeing to leisure. Together with the organisers, UNStudio has incorporated a possible future lifecycle into the design of the Theme Pavilion by allowing a transformation of the buildings into a hotel building, accommodating conference and teaching facilities. As part of the design process, the future use of the Theme Pavilion is therefore incorporated into the DNA of the design. 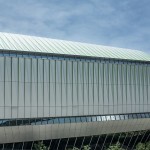 Façade engineering: Senyang Yuanda Aluminium Industry Engineering CO.,LTD-Special Project Group.